Best New Chef in Los Angeles: Dakota Weiss. With two more payments left for my daughter’s culinary education at Scottsdale Culinary Institute, I’d almost be happy to make more. 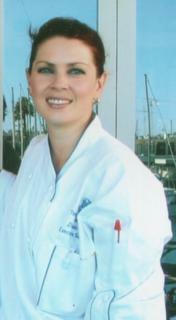 Angeleno Magazine’s August 2006 edition, named Dakota as “Best New Chef “in Los Angeles. I know she’s talented. She has always had the mind (and temperament) of an artist. But to see her uniqueness qualified with a portrait and complimentary verbiage like “…in just a few short months, she’s already pulling rabbits out of the hat…she’s elevated it to the next level…” well, I’m wearing a hole in the tile from doing the happy dance. Clif and I were thrilled when Dakota was asked to bring her toque and knives to Jer-ne in Marina del Rey. It’s a quick and direct flight for us. When she was in Dallas, it was too muggy and hot, Atlanta was fun, but a bit of a trick for Albuquerque flights without hassle, and her stint in Sarasota was great, but the flight was too long for my antsy-legged husband. Dakota has deep LA roots. Her great-great grandfather (Matthew E. Copeland) developed real estate above Echo Park (where I lived as a baby). He built a beautiful home for his artist wife, Rilda, and their daughter Osa who graduated from Los Angeles High School. Osa was a pianist who married a Georgetown University grad, Arthur Hughes, a practicing attorney. Osa and Arthur’s son, Charles, was also an attorney of note, who was better known as “Cyanide Charlie” for his lack of mercy as a California Superior Court, Criminal Division judge. And did I mention that Los Angeles Magazine this month has also named Dakota’s Maine Lobster and Brie Grilled Cheese sandwich one of LA’s top five sandwiches? It sounds as though Los Angeles is glad for the return of a real California girl — LA’s Best New Chef.